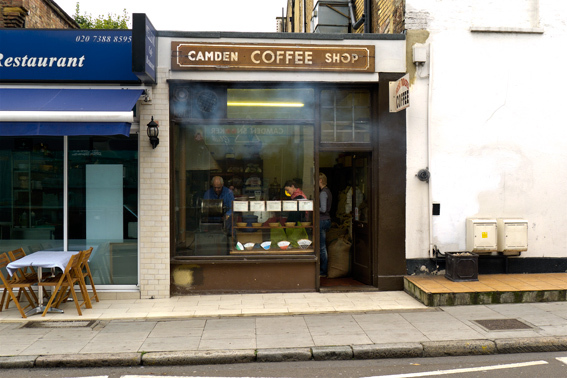 The Camden Coffee Shop has been in Dalancey Street, Camden for about 60 years. George, the present owner, bought it equipped with beautiful 50’s coffee processing machines, from his uncle in 1978. It’s an old fashion shop full of the charm that new cafés and coffee shops completely lack and frankly, it’s the kind of place I’ve always looked for in countries like Greece, Spain and Italy. Fortunately, George originally trained as an engineer, so he maintains the machines himself – that’s why, everything is so perfectly preserved. Generally I buy George’s continental blend of beans, which I grind at home, he won’t tell me what the blend is, but I don’t blame him for hanging on to his trade secrets. 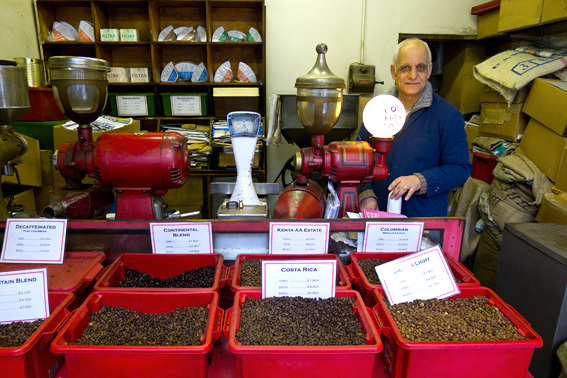 George buys coffee beans by the sackful and roasts them on the premises in the traditional way. It’s fascinating to see them spinning in a smoking cage, having observed the process a few times, it would seem that, when the beans almost catch fire and sparks fly they are done (about 20 minutes). George deftly puts the flame out and allows the beans to cool in the window. As you can see from the picture, there’s a range of coffee from rich Kenya AA to full-bodied Colombian. This is excellent coffee that you can’t buy in supermarkets. The Camden Coffee Shop is at 11 Delancey Street, NW1 7NL. This entry was posted in Shopping and tagged Camden, coffee. Bookmark the permalink. I love this shop . I love the way you have captured the smoke coming from the vent … I can almost smell it now . It flavours that area of Camden …it is heavenly.